Our Concealed Cistern (Front Entry) is the ideal cistern to add to any new back to wall toilet. This cistern is concealed in your new vanity unit or wc unit to create a designer fitted look that will hide all plumbing. This cistern comes complete with a chrome dual flush button that offers a choice of either a 3 or 6 litre flush to put you in control of your water consumption. 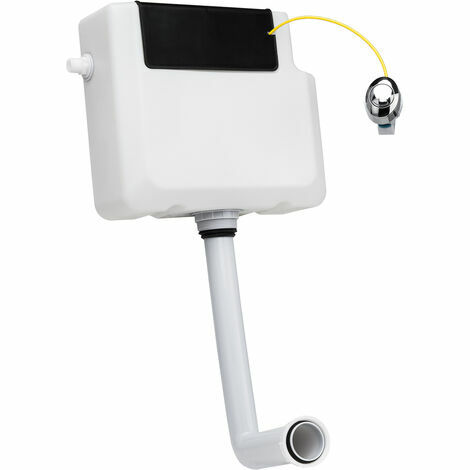 A concealed cistern is used in conjunction with a wc unit and back to wall toilet. This style is often favoured instead of a traditional close coupled toilet because it cleverly conceals all plumbing and wastes neatly within. This concealed cistern is needed to provide the back to wall toilet with water, allowing it to flush. The cistern is held within the wc unit for support and includes a modern chrome dual flush button which allows you to control your new back to wall toilet as needed. If you opt for a close coupled toilet then this won't be required, but if you're looking for a fitted look then you'll need a concealed cistern to turn your dream into a practical and functional reality. Why Choose a Concealed Cistern? You'll only need to choose a concealed cistern if you want your new bathroom to include a back to wall toilet and wc unit. You need the concealed cistern to allow your new back to wall toilet to flush within the wc unit. If you opt for a close coupled toilet then you won't need to include this in your order.